. Tomorrow is just another Monday and back to the office. Of course I didn’t finish even half of my list but that is more than ok. I know when I makes lists like that they are kind off ridiculous but they do help me to focus, set some priorities and make sure that I don’t dwindle my time away. And of course there are always things that pop up that weren’t even on my list. Like doing taxes! Oj, for the first time in a looooong time I have done my own taxes, business and all, and I am mighty proud. Took me all in all a day or so to figure it all out and then do My Love’s taxes too, but it also feels good that I have managed to teach myself yet another thing to do myself. And this weekend I had some plans to get started on a few more bedroom projects. But Mr. Songbird had other plans. Ever since we did the major overhaul of our garden terrace, we have been meaning to plant some fruit trees in a now vacant spot. And it must have been the lovely sunshine, but My Love couldn’t rest until we had bought us those fruit trees. So off we went out buying trees. As per our usual fashion we made a day out of it. Having lunch here, admiring some lovely landscape there, doing a little errand on the way, until late in the afternoon we finally arrived at the garden nursery. We picked out an apple and a pear tree. We selected some yummy apples, which according to the description are sweet and juicy with a nice ‘perfume’. And the pears are supposed to bear lots of fruit too. Once we’ll have the wire up to attach them too, I will have to cut them into shape. That is gonna hurt. Hurt me, I mean, the grower assured me both my apple and my pear love to be cut, it makes them grow and carry fruit all the more vigorously. But look at these lovely buts, I am going to have such a hard time, being ruthless. But I know I’ll have to toughen up, gardening is not for sissies. While My Love was busy trying to get some poles up to guide the trees, I pottered around in the garden. Sometimes with my gloves on, but mostly with my camera. There is still a lot of dead, brown leaves everywhere, but there is also so much hope-of-good-things-to-come too. Yep Rhubarb. I was planning on cutting this on in half because it is mighty big when fully grown, and I want it in an other place, but I might be too late to replant it. Must find out soon!!!! I am certain I didn’t plant any narcissus bulbs here, but this little tête-à-tête narcissus is here nevertheless (and yes I totally had to practically lie down to get this shot, but it was worth it). I keep the colors in my back garden mostly in the pink-purple range, so these yellow narcissus clash like hell. But since not much else is blooming anyway and because I love these little heralds of early Spring they may stay. I guess it is more than fitting that I spent most of my last weekend of Spring break in my garden. It felt so good to be outside, and my head is filling up with plans for my outdoor space. There is a lot of work there still waiting for us and I can’t wait to dig in. Daylights savings starts next weekend and then I will be able to do some outside work after office hours too. Speaking of loving flowers, these soft floppy petals from this violets are high on my favorite list too! They don’t need more than an old fruit crate to fit right in. Those are beautiful in the old crate, Marianne! One is just uplifted by walking through and gazing at the growth, aren't they? Wish you had our pear trees. They're prolific with fruit and we don't care for pears! I love your trees! Won't they be beautiful! 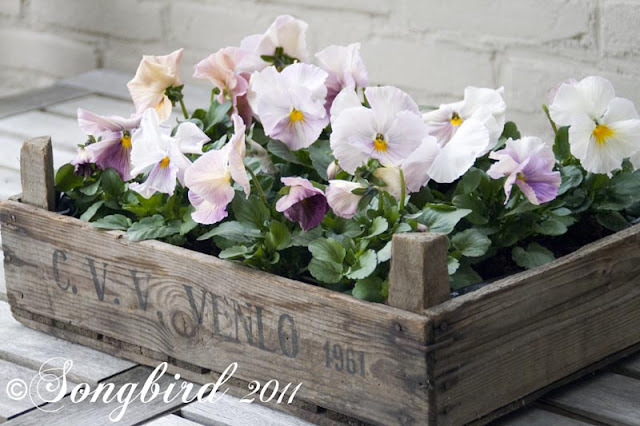 And that little crate of pansies is adorable. Nice post. You have me yearning for the outdoors! I must wear boots out in the mud right now. But before long I wil be enjoying the Springtime weather and longer days! I'm thankful for daylight savings time! that is so cool to see the trees grow in that shape along the fence. i've never learned how to do that, in fact…I'm not allowed to prune any shrubs or trees around here. I tend to maim if not kill the poor things. So…maybe you'll give us a tutorial? It'd be something I'd watch for sure. Then I can run and tell the family, I had a tutorial and know what I'm doing now, and maybe… well, maybe not. But you can show me how anyway… LOL! Heb ze nog niet maar hoop komend weekend op pad te kunnen om iets te kopen…ben ZO toe aan kleur in de saaaaaaie tuin. Jeetje zeg, wat is het allemaal al ver bij jullie! Er komt dan wel al hier en daar een knopje, maar zo echt lente is het nog niet in de tuin…Maarja, dan geniet ik gewoon al wat voor met jouw fotos! Those flowers are simply stunning! I can't wait for your garden to be in full bloom! Viooltjes, dat wil ik ook! Helaas moet de sneeuw hier eerst nog wegsmelten en dat kan nog wel even duren. Tuinieren kan hier eigenlijk pas echt na Moederdag. Voor die tijd vriest het 's nachts nog te hard. Maar donderdag vlieg ik voor een weekje naar Nederland, misschien kan ik bij mijn moeder even in de tuin spelen. Wat mooi zo'n volle bak met Violen en zo mooi van kleur. Ik heb ook veel bakken met Violen staan, ze brengen nu zoveel fleur. Het verbaasde mij ook al dat alles bij jou in de tuin al zo ver is.